Great family accommodation! 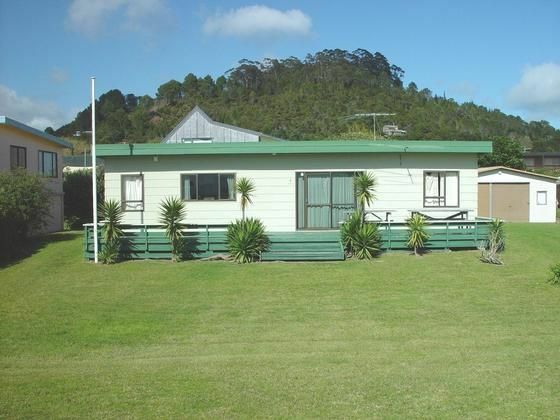 Located directly opposite the beach and with fabulous sea views of the Mercury Islands this classic kiwi bach, one of first built on Cooks,offers all the comforts of home and is the perfect holiday destination. Single level dwelling with all mod cons and separate sleepout - includes an extra outside toilet, shower and sink. Additional solar shower and property on filtered bore water. Sleeps up to 9 with ample parking, fish cleaning bench. 5 mins. to boat ramps.4wd launching also available in centre of beach .CLEANING service Compulsory $50. SMOKING ONLY OUTSIDE ! Absolutely NO! Smoking inside,bond will be retained if evidence is found on inspection . Brilliant Kiwi bach. Great sea views, so fun to walk straight across the road with the paddleboards. Will definitely be back to stay. Perfect location? for grandchildren to boogie board all day. Perfect location for exploring the area. Nice location and house is ok to stay in. Nice location and house is ok to stay in. Only issue being the ants. They were everywhere, got into our parked cars, our suitcases. all food had to be thrown away and bought new daily. There is a great big sign on notice board that states there is ants and not to leave any food out as they are attracted immediatly . Actually all of the beach has an ant problem , Also in your original request you did say it would be a nice place to have a wedding ,i thought you meant cooks beach , not actually holding the reception at this bach . Going by the mess left and amount of towels that were used ,which was not part of the rental aggreement i am not surprised that you got ants. Just the most amazing location.